East Rutherford, NJ – Even Marcus Miller must have been surprised at how easy things went for him and Trolley in the Friday night (March 22) feature at the Meadowlands. Trolley and driver Marcus Miller coast home as much the best in the Friday night feature at the Meadowlands. Lisa Photo. In a field where one scratch (Zlatan) left but six starters in the $25,000 Preferred Handicap for trotters, Miller urged Trolley from the start, setting sail for the top and leading at the quarter in :28.3. The 6-year-old Donato Hanover-Lakeside Bride product continued his sleepwalk to the half in :56.3 as pocket-sitter Rubber Duck and Sutton – who was racing in the three hole – did not move a muscle. The Erv Miller-trained Trolley returned $3.80 to his backers after completing the mile in 1:53.3. He’s now won five-of-six this year while facing the best stock on the grounds at the Big M. He has 16 wins from 31 career starts and earnings of $353,209 for owners Michael Anderson, Leland Mathias, Greg Gillis and Louis Willinger. In the co-featured Preferred Handicap for fillies and mares on the pace, Divas Image, who looked rough-gaited at the start, settled for a fourth-over trip, tipped wide in the stretch, then exploded home in :26.3 to record a one-length win in 1:53.2 as the 3-5 favorite for driver Andy Miller. Believe In Me was second with Newsday third. 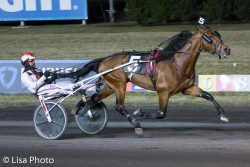 Divas Image, a 6-year-old by Bettor’s Delight-Rocknroll Diva, won for the second time this year in five starts (two-for-three at the Big M) and now has won 23-of-70 lifetime outings and banked just over $575,000. A VERY GOOD START: Friday marked the first-ever Can-Am Pick-4 – a wager where one must pick the winners of two races at both the Meadowlands and Woodbine Mohawk Park – and the response was vigorous. A total of $57,489 was poured in the pool and after a sequence that saw winner’s odds of 5-2, 6-5, 11-1 and 7-2, the return was a handsome $596.51 for a 20-cent bet. The Can-Am Pick-4 will be offered on Friday nights. A LITTLE MORE: One player wagering into the Oregon hub was the holder of the only ticket to last five legs in the 20-cent Survivor Pick-10 and walked away with $10,549.56. … During the course of the 13-race program there were six winning favorites, but longshot players hit big in the third race when La Dolfina ($99.80) scored at 48-1. Five races later, Piercewave Hanover skimmed the cones at 60-1 and returned $128.20. … All-source handle totaled $2,634,286. … Racing resumes Saturday (March 23) at 7:15 p.m.